Everything about the car feels unique. The only piece recognizable as a Toyota-sourced part is the mouse-like controller for the infotainment system — nothing else seems to relate to anything in the Toyota/Lexus/Scion family. This may be one of the downfalls of the LFA as a halo car. It is really tough for a Lexus IS 250 owner to tell his buddies he is basically driving the detuned version of the LFA when they have nothing in common — not even HVAC controls or seat buttons. Let’s reverse this — can you imagine how Motor Trend would have ridiculed the LFA if it had shared interior parts with an IS 250? Not only that, can they not see the LFA styling cues in the CT 200h, the 2011 IS F interior and the LF-Gh concept? 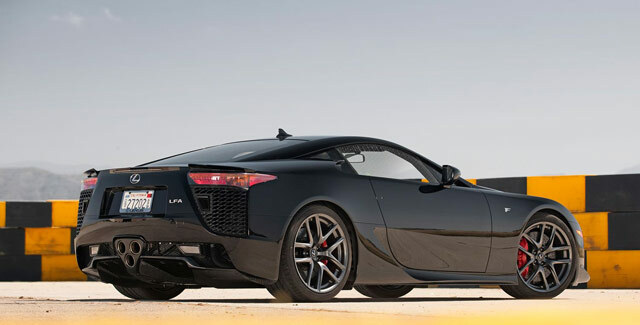 The driving experience in the LFA is also nothing short of exotic. The first thing you notice is how amazingly loud it is. Modern supercars have loads of sound insulation and acoustically engineered glass to keep things at reasonable levels. Even Ferraris and Lamborghinis seem like Bentleys inside compared to the LFA. Several our testers, myself included, expressed disappointment that the F1-like wail of the V-10 is turned into a somewhat annoying bellow once inside the car. This marks the first time, in all of the LFA reviews I’ve read, that I’ve seen a complaint about the LFA’s sound. And asking for more sound insulation? Seriously? This is amplified by the Toyota V-10’s willingness to rev and chase after 9000 rpm on the tach. The high-revving engine makes the whole car frenetic and buzzy. You have to anticipate shifts as the fake needle swings around the computer monitor behind the steering wheel. Does Motor Trend refer to the engine in the Audi R8 as the “Volkswagen V-10”? Was “fake” really the only adjective available to describe the LFA’s digital display? Pointing out little things like this might seem petty, but it perfectly illustrates the tone of their entire review. Of course, all this goes without mentioning their abysmal performance testing — for all their expertise, the best 0-60 time Motor Trend testers were able to achieve with the LFA was 4.0s. This is 0.2s worse than their original road test, and 0.4s worse than InsideLine, just to name a couple examples. Laughably, this poor showing is used as ammunition against the LFA. Head-scratching, that’s the only way I can describe it. A good showing for the old girl.